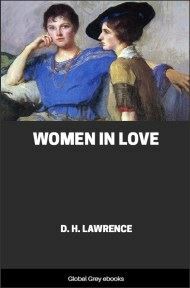 Women in Love is widely regarded as D. H. Lawrence's greatest novel. 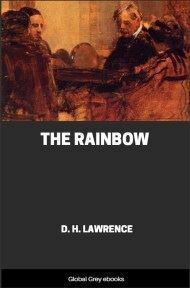 The novel continues where 'The Rainbow' left off with the third generation of Brangwens: Ursula Brangwen, now a teacher at Beldover, a mining town in the Midlands, and her sister Gudrun, who has returned from art school in London. 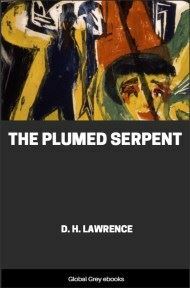 The focus of the novel is primarily on their relationships, Ursula's with Rupert Birkin, a school inspector, and Gudrun's with Gerald Crich, an industrialist. Ursula and Gudrun Brangwen sat one morning in the window-bay of their father's house in Beldover, working and talking. Ursula was stitching a piece of brightly-coloured embroidery, and Gudrun was drawing upon a board which she held on her knee. They were mostly silent, talking as their thoughts strayed through their minds. 'Ursula,' said Gudrun, 'don't you REALLY WANT to get married?' Ursula laid her embroidery in her lap and looked up. Her face was calm and considerate. A shadow came over Ursula's face. 'You don't think one needs the EXPERIENCE of having been married?' she asked. 'Do you think it need BE an experience?' replied Ursula. Gudrun sat very still, to attend to this. 'Of course,' she said, 'there's THAT to consider.' This brought the conversation to a close. Gudrun, almost angrily, took up her rubber and began to rub out part of her drawing. Ursula stitched absorbedly. 'You wouldn't consider a good offer?' asked Gudrun. 'I think I've rejected several,' said Ursula. 'A thousand a year, and an awfully nice man. I liked him awfully,' said Ursula. The faces of both sisters suddenly lit up with amusement. 'Isn't it an amazing thing,' cried Gudrun, 'how strong the temptation is, not to!' They both laughed, looking at each other. In their hearts they were frightened. There was a long pause, whilst Ursula stitched and Gudrun went on with her sketch. The sisters were women, Ursula twenty-six, and Gudrun twenty-five. But both had the remote, virgin look of modern girls, sisters of Artemis rather than of Hebe. Gudrun was very beautiful, passive, soft-skinned, soft-limbed. She wore a dress of dark-blue silky stuff, with ruches of blue and green linen lace in the neck and sleeves; and she had emerald-green stockings. Her look of confidence and diffidence contrasted with Ursula's sensitive expectancy. The provincial people, intimidated by Gudrun's perfect sang-froid and exclusive bareness of manner, said of her: 'She is a smart woman.' 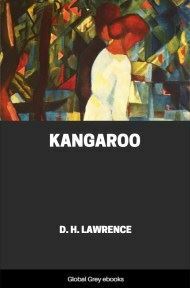 She had just come back from London, where she had spent several years, working at an art-school, as a student, and living a studio life. 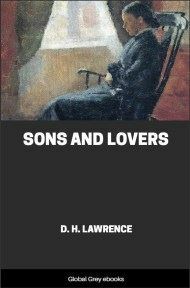 'I was hoping now for a man to come along,' Gudrun said, suddenly catching her underlip between her teeth, and making a strange grimace, half sly smiling, half anguish. Ursula was afraid. 'So you have come home, expecting him here?' she laughed. 'Oh, everything—oneself—things in general.' There was a pause, whilst each sister vaguely considered her fate. 'It seems to be the inevitable next step,' said Gudrun. Ursula pondered this, with a little bitterness. She was a class mistress herself, in Willey Green Grammar School, as she had been for some years.